MS-UNO, the predecessor to the MS-DOS operating system, was the first disk operating system ever programmed by Microsoft. The brainchild of Bill Gates's 16th century Spanish ancestor, Enrique Iglesias Gates, incorporated the latest interface technologies of its day such as the quill pen and parchment scraps, far outpacing contemporary rivals (who were working on a primitive display unit composed entirely of colored apples). Dismissed as a revolutionary in his day, Gates went into hiding, and his discoveries were only clumsily implemented 400 years later. Slaves from Africa were noted for being brilliant programmers for the operating system and were able to translate it into their own languages. They also programmed complex GUIs (Graphical User Interfaces), often puzzling their masters, who were known to be "as dull as logs". Abraham Lincoln was an excellent programmer himself. He was also a fan of the GUIs the slaves used. However, John Wilkes Booth hated the GUIs, and tried shooting a programmer sitting next to Lincoln. Fortunately, he missed. 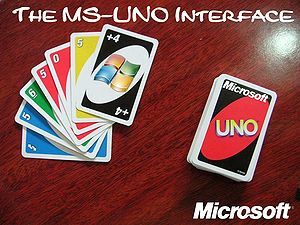 "Uno" in Spanish means "one" in English, therefore "MS-UNO" clearly refers to the first software by Microsoft or "MS-One". 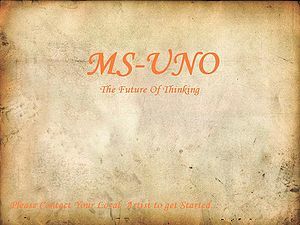 As stated above, the technology of MS-UNO was not exposed in world until 1942, being forgotten by most but unmisremembered by few, since this took place during World War II. It took over 40 years until "those few" programmed MS-DOS, which was during a time when the world of computing was rapidly growing. Consequently, MS-DOS gained plenty of market share until the Windows operating systems were introduced in the early '90s. Comparing MS-UNO to MS-DOS, it is clearly seen that the programmers of MS-DOS had mostly forgotten the specifications of MS-UNO, rendering it a semi-obsolete resource and starting fresh and basic with a plain black-and-white text user interface. No other operating system looked as graphically advanced as MS-UNO's user interface except for those of all systems after Windows 2.0. It is also easy to notice that the modern Windows operating systems are visibly reminiscent of the original MS-UNO userface with a fundamental start menu and desktop icons. If only Enrique Iglesias Gates had not been dismissed and had not went into hiding, Microsoft would have advanced much more rapidly in its programming technology, instead of waiting until the 1980s for ideas of MS-DOS. MS-UNO's popularity declined as electricity became more popular. It ended up becoming forgotten by most, except for a select few. Currently, MS-UNO 1.0 is being reprogrammed by a middle school student (one of the select few) for all those in the world who have forgotten. It will be introduced to the world of computing in a matter of months and you will probably be able to download it from this web page free of charge by next April. The reprogramming of MS-UNO 2.0 is planned for completion by next year. Much speculation has gone into why Bill Gates discoveries did not receive recognition in his day. Some say that his ideas were just too revolutionary while others speculate that the asking price for the basic "home edition" was just too bizarre. This page was last edited on 6 September 2012, at 05:17.